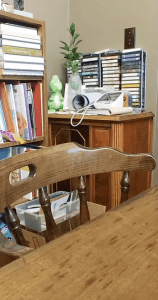 Reorganizing your home after an elderly parent or in-law moves in can be challenging. I mean, I think I know now why they call this whole caring for elderly parents thing the Sandwich Generation. It’s because you are squished flat, underneath piles of STUFF. See, a little over a year ago my mother-in-law moved in with us. 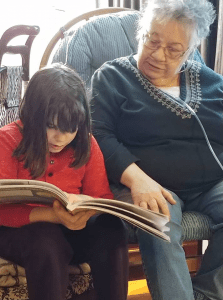 For a long while, she had been focused on taking care of my father-in-law who has Alzheimer’s. The problem is she was so focused on him that she wasn’t taking proper care of herself. She became critically ill, and after a three week stay in the hospital, came home to live with us. This four bedroom home, which seemed so massive when we first bought it sans-kids, is now stuffed to the gills. Three adults, two kids, and STUFF. So, so, much stuff. There are so many positive aspects to having Bubby, as my kids call her, live with us. For one, we don’t have to worry about her being on her own, about something happening to her and us not finding out quickly enough. Having her here with us gives me peace of mind. And having another adult in the house is handy. Particularly someone fluent in French, who’s always happy to help my kids with their homework. When it comes to kids, I think it is never bad to have another permanent adult presence doling out love and attention. No such thing as too much love, right? However, to say that this past year has been one huge adjustment would be an understatement. Everything has been change. Changes in routines and structures. Changes in everything from how our family runs to how our house is set up. It took eight month’s to empty out my in-laws house. My mom helped. The two of us would go a few times a week and spend the day there, cleaning, sorting and packing. My father-in-law’s family had owned the house since 1960-something. It was full of two generations of, well, stuff. 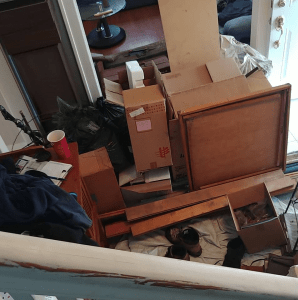 We hired Just Junk to help clear out the attic and it was like a magic trick, or a clown car routine, the crazy amount of stuff that they carried down out of that attic. We found three Christmas trees. 8-track tapes. Old board games, paperbacks and magazines. Two truckloads full. And that was just in the attic. Disclosure: This post is sponsored by furniture.ca. As always my words and opinions (and adventures in life as a sandwich) are all my own. I lost track of the number of loads that my mother and I drove over to donate to the Goodwill. We brought at least one load every day that we worked on the house, sometimes it was two, or three, or four loads. We filled her van to the top with household chemicals, cleaners and paints to recycle. We brought boxes and boxes of personal papers to the shredders. We brought load after load of broken old things to the dump. A life time’s accumulation. Two life time’s. And of course, while she parted with a lot, there was plenty that my mother-in-law wanted to keep. Naturally, the emptier her house got, the fuller this one became. Our long term plan is to get an addition built on the back of the house, adding another bedroom or two, and giving us some much needed space. But in the meantime, this place is full to the seams, full to the point of bursting. My house, which if I’m going to be brutally honest has never been a magazine layout kinda place to begin with, looks like a warzone. It looks like the place exploded. Like we are either getting ready to move or are auditioning for an episode of hoarders. Bubby is on oxygen, which means she has this long cord that runs from the compressor set up in our front room to wherever she is in the house. That and the fact that she has problems with stairs pretty much limits her to the ground floor. My oldest daughter’s bedroom is on the ground floor. Or rather I should say was, because she gave up her room and moved upstairs into her little sister’s very tiny bedroom. Having the two girls together in one small room has proven to be one of the most challenging aspects of having Bubby live with us. They fight constantly, and bedtimes are anything but peaceful. The ground floor bedroom that once doubled as my daughters’ play space, the one that had all the picture books and the train table, is now home to a queen-sized bed, a six drawer dresser, a vanity, a file cabinet, a full-sized china cabinet and a padded bench seat. We got rid of the train table, but I managed to squeeze that six-foot bookcase full of my daughters’ picture books into the dining room. The toys that used to fit into their two bedrooms are now stacked in the front room. The 6th grader’s desk is on the hearth, blocking off the fireplace, which we never used anyway. The bench with the bins in the bottom, where we store my daughter’s stuffed animals, is sticking out of the front room and into the hallway. 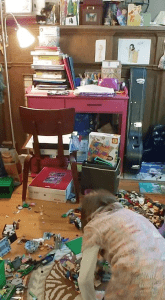 Lego explosion, as my girls play at building. And, well, a desk on the hearth — totally normal, right? I’m still battling with anemia, which means most days I have the energy of a sea-sick slug, but I have been working steadily away at trying to reorganize our household. Trying to sort through our belongings, find things we don’t really need and donate them. I find myself reading articles on storage and organization. 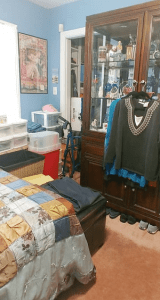 I realize that buying more things may seem a bit counterproductive when we are trying to pare down, but I have been hunting around for storage options and ways to reorganize. I’ve become a bit obsessed with it. I spend afternoons browsing online through page after page of storage options. As if replacing all of the footstools in the house with storage ottomans will be the magical turning point that will somehow give us some space back. But seriously, if I can replace some of our existing furniture with pieces that fit better into the room, or hold more things, it’s probably worth it, right? What about you folks? Have you ever tried to shoehorn an extra adult (and all of their belongings!) into your home? Got any suggestions on how to reorganize? I can well understand your problem of limited space. You collect an enormous amount of various things over a life time, without really realising it. I was sad when I moved, lots of wonderful, modern solid oak furniture had to be sold off very cheaply or given away. Lots of clothes from a family of 8 went to recycling. Pottery, crystals lamps, vases, glasses – the list goes on and on. There is only so much you can take with you when you move from a 4 bedroom house to a basement flat.